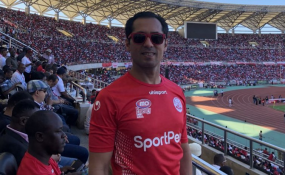 TANZANIAN billionaire and industrialist Mohamed Dewji, MO, was yesterday abducted by the unknown armed people as he attended fitness session at the Colosseum Hotel and Fitness Club in Dar es Salaam. Already, the police are holding ten people including the hotel's three security guards who were on duty during the incident at the posh Oysterbay suburb in Kinondoni municipality. Dar es Salaam Special Zone Police Commander Lazaro Mambosasa confirmed the abduction of the 17th richest and youngest billionaire in Africa, saying the law enforcers were hunting for the kidnappers. Commander Mambosasa said the abduction of the famous businessman was committed at around 5am, adding, "We are already on it, efforts are underway to have him rescued alive." He said, the security officers across the country and all exit points from Dar es Salaam were put under high alert in the hunt for the abductors, adding that initial information had it that the abductors, two of them white, arrived at the scene in a Toyota Surf vehicle. The police commander explained further that before escaping with the billionaire who served as Singida U rban MP on the ruling CCM ticket between 2005 and 2015, the kidnappers fired shots in the air. "Three people are under arrest in connection with the abduction, they have to assist the security organs on investigation because they were here when the abductors came, and even the security cameras were not in use when the abductors came," he noted. At the scene, Dar es Salaam Regional Commissioner Paul Makonda said Mr Dewji had no security guards and had personally driven to the gym. "And this was his normal practice because he was used to peace although he is rich enough to hire body guards," he explained. Mr Makonda asked city residents to remain calm as security organs work hard to trace the whereabouts of the 43-year old business mogul, warding politicians from using the incidents for their political gains. "We welcome all members of the public who have tips that would help us to rescue Mr Dewji alive," said Mr Makonda who also chairs the Regional Defence and Security Committee. MO is Chief Executive Officer of Mohammed Enterprises Tanzania Limited (METL), a group company with several subsidiaries in beverages, edible oils, flour milling and textile manufacturing and soaps, among other commercial activities. METL operates in at least 10 African countries and has ambitions to expand to several more. The billionaire is as well the major investor in the reigning champions of Tanzania Mainland premier league, Simba Sports Club (SSC). Recent report by a popular financial magazine, Forbes, put Mr Dewji's net worth at 1.5 billion U S dollars (over 3tri/-). Until this paper went to press last evening, neither the whereabouts nor the motive behind the abduction of Mr Dewji had been established.